NEW YORK CITY, January 26, 2016 – GFNY World, the global cycling marathon series, will stretch around the globe in 2016. 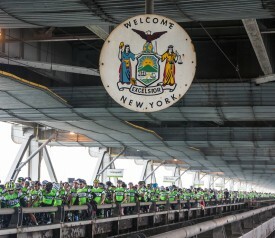 Each GFNY World event offers participants a consistent GFNY experience complemented with each location’s local flair. GFNY events are open to professionals and amateurs alike. The year kicks off with GFNY Uruguay on March 6 in South America’s Saint Tropez, Punta del Este. The second annual CRM GFNY Colombia held just outside Bogota on April 10, will challenge riders with the famous La Cuchilla de Guasca climb reaching 11,031 feet (3362m). The GFNY Championship will be held in New York on May 15. 5000 riders from over 70 countries are competing on a challenging 100 mile course with over 8,600 feet of climbing. On June 26, GFNY returns to the legendary peak of Mont Ventoux, just three weeks before a Tour de France stage will finish at the same location. The inaugural GFNY Mexico City on the same day starts in the heart of the Latin metropolis with a course fully closed to traffic that finishes in the mountains above the city. GFNY Deutschland on August 28 is a chance for riders to enjoy smooth German roads and great post race beer. On September 18, GFNY Italia brings GFNY cycling to the home of granfondo for the third time. The coastal host town of Terracina is just 90 minutes south of Rome and delivers one of the most beautiful courses in Italian granfondo cycling. GFNY premieres in Asia on October 2 with a race on the tropical island of Lombok, Indonesia. On October 30, the second annual GFNY Argentina is held in San Luis, South America’s hub for bike racing. The third annual GFNY Cozumel is arguably the best way for any cyclist to finish off the 2016 season. With its sandy beaches and tropical weather, the event is a cycling marathon in paradise. While GFNY is currently evaluating several dozen requests from event organizers to hold further events in Asia, Europe and Latin America, there is a growing interest within the United States as well. The driving force is the eagerness of cyclists not just to ride their bikes but also to challenge themselves against the clock and against other cyclists. GFNY expects to host other events in great US destinations starting 2017, and to continue the expansion of GFNY globally.